After getting home at 4am following a night of dancing, my friend Liana and I decided that we were going to get smoked salmon for lunch the next day, or later that day should I say. But after a slightly longer than planned lie in (I think all that dancing had worn me out) and a lengthy gym session it was time for dinner rather than lunch – and we were in charge of cooking for the whole family! Chicken is pretty central to our diets so dinner was of course centred around that. Whilst the chicken is baking in the oven, prep the veg for roasting. Leave out the capers, olives, sundried tomatoes and nuts. Add the veg to a roasting tin before adding the chopped tomatoes, passata and some cracked black pepper. 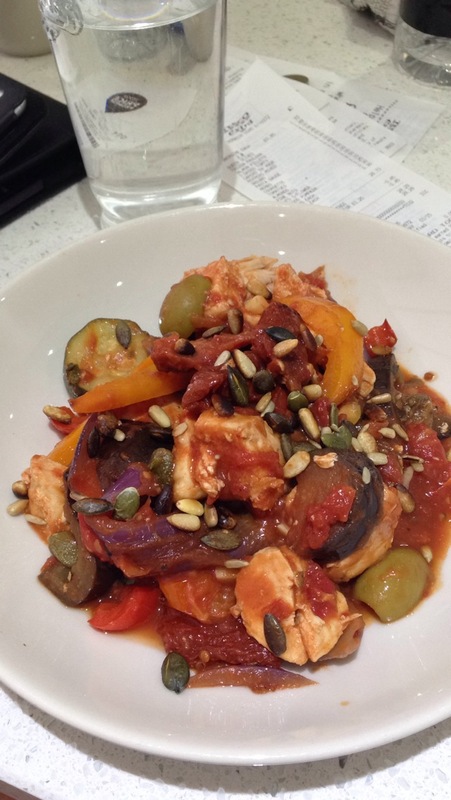 Once the vegetables are cooked, chop the chicken and stir in before adding the olives, sundried tomatoes, toasted pumpkin and sunflower seeds and fresh basil. Another simple yet extremely tasty meal that sticks to the clean eating plan. For those who want to add something exta, throw in some sweet potato to the roasted vegetables.